Within the ever-changing state Class 2A rankings, one team settled into a familiar position each week – Eagan. The Wildcats consistently found themselves at the No. 10 position in the rankings each week and rode that consistency to the top eed in Section 3AA. Eagan was chosen as the No. 1 seed over South Suburban Conference rival Apple Valley after defeating the Eagles 4-2 in their first meeting on Jan. 6. The teams skated to a 3-3 tie in the their second meeting on Feb. 5. With Apple Valley as the No. 2 seed, the Wildcats may see their rivals in the section championship, a trip to the state tournament on the line. Eagan coach Mike Taylor is no stranger to how tough the Eagles are. Eagan is looking to rebound in section play after ending the regular season with a 3-2 loss to surging Bloomington Jefferson. That loss snapped an eight-game unbeaten streak. Despite Eagan’s recent loss, Apple Valley is still not overlooking anyone. Both Eagan and Apple Valley are fueled by underclassmen but these young players aren’t hindered by inexperience. 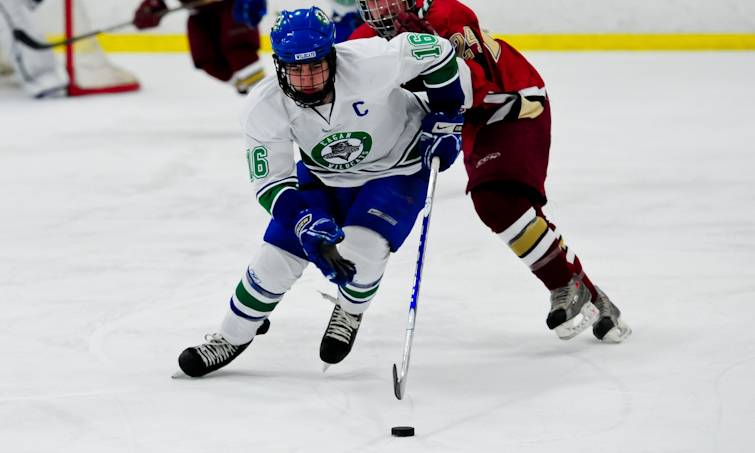 Junior forward Michael Zajac led Eagan in scoring with 51 points (23 goals, 28 assists) in 25 games after being Wildcats’ top scorer last year during the playoffs with six points (five goals, one assist) as a sophomore. Zajac was chosen as a co-captain for this season along with senior goaltender Tommy Bodeker, who has posted an 11-6-2 record along with a 2.22 goals-against average and .888 save percentage. Apple Valley’s young leadership starts with junior forward and University of Minnesota-bound A.J. Michaelson (29 goals, 31 assists) and sophomore standout Hudson Fasching (16 goals, 29 assists). Hayes knows he’ll need his young stars to shine in the postseason. “This time of year, it’s cliché, but you need your big time players to play big in big games,” Hayes said. Lurking in the shadows of Section 3AA are upset-hopefuls Cretin-Derham Hall and Hastings. Cretin-Derham Hall's season résumé includes a win against Section 2AA No. 1 seed Edina, a 4-4 tie against Section 4AA No. 2 seed White Bear Lake and a one-goal loss to Section 4A No. 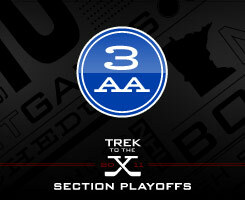 1 seed St. Thomas Academy. After posting a 9-15-1 record last season, Hastings went 12-12-1 this year thanks to an impressive 54-point (31 goals, 23 assists) performance by senior forward Austin Nelson. Several close games against section opponents make the Raiders a team with ‘bracket-busting’ potential. Apple Valley may hold a 0-1-1 record against top-seeded Eagan but the Eagles may be peaking at the right time. All cylinders seem to be clicking for Apple Valley. A.J. Michaelson and Hudson Fasching are fueling the offense, defensemen Vince Pedrie and Derek Smith are producing at both ends and senior goaltender Aaron Gretz picked a great time to heat up, going 4-0-1 in February. Hastings may not make it to the state tournament this year but they won't lie down and allow other teams an easy road to the Xcel Energy Center. Echoing their 12-12-1 regular season record, the Raiders have a .500 win percentage (5-5-0) against section opponents this year - and three of those losses were by one goal. If senior forward Austin Nelson - 54 points (31 goals, 23 assists) in 25 games - can stay hot, look for the section's No. 4 seed to cause a stir.